Essential Oil Carrier Oil is a light emollient fluid fortified with some of the finest natural ingredients and antioxidants. The carrier oil starts with a derivative of coconut oil , which is colorless and odorless and easily absorbs into the skin. Because it is colorless and odorless, it is an ideal carrier for our pure essential oils. Increased caprylic triglyceride (from coconut oil). Squalene, Rose Hip oil, Sesame seed oil and Apricot Kernal oil. Paired with Forever Living's Essential Oils creates a powerful, deep skin penetrating experience. Essential Oil Carrier Oil is fortified with vitamins A, C and E along with borage oil , rose hips oil , sesame oil and apricot kernel oil . This powerful blend of antioxidant vitamins and natural oils rejuvenates the skin at the same time it helps deliver the benefits of the Forever Living's Essential Oils. The true foundation of Essential Oil Carrier Oil is pure stabilized Aloe barbadensis Miller leaf extract, which naturally penetrates and nourishes our skin and is one of natures perfect carriers. 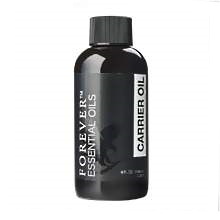 Carrier Oil is formulated to work synergistically with each Forever Living's Essential Oil to maximize their unique benefits. The key that differentiates this exclusive formula is our combination of squalene , rose hips, sesame seed, apricot in a base of Aloe Vera and vitamin E. This unique blend is is much more supportive of the skin and provides deeper penetration for greater overall effectiveness. Dilute 2 to 4 drops of any of Forever Living's Essential Oils in one teaspoon of Carrier Oil for topical or aromatic use.